I know what you’re thinking. “Where the hecky wecky were you?” Uh, to be honest, I just moved recently, and I’ve been really busy with unpacking and schoolwork. 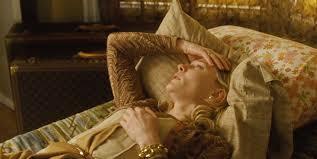 But recently, I caught up with Woody Allen’s Blue Jasmine, from which I actually waited about a month for. Was it worth it? Jasmine (Cate Blanchett), is a socialite who just went broke after her husband (Alec Baldwin) commited suicide. She moves to San Fransisco to live with her sister (Sally Hawkins) and her husband (Louis C. K.) while trying to revaluate her life. I was introduced to Woody Allen through Midnight In Paris, which I believe was a much better movie. While that film brought up a lot of interesting questions and felt very cinematic, this film feels like a stage play, and seems very flat and obvious. As an example, the opening scene has Jasmine telling an old woman about her woes on the plane to San Fransisco. We get the feeling that Jasmine is egotistical and a bit of a blabbermouth. And at the end of the scene, the old lady is telling her husband. “She just wasn’t stopping. It’s like she was only thinking of herself”. As if we couldn’t figure it out for ourselves. On top of that, the movie keeps switching between Blanchett’s past and present without any warning, so we’re constantly trying to figure out “Does this scene take place in the past or the present?” And because we’re constantly jumping through time, it gives us no time to understand the characters or their motivations. For example, Jasmine spends a whole scene telling her sister how she doesn’t want to work as a receptionist, and suddenly she’s working as a receptionist. But, on the other hand, Hawkins and Baldwin both turned in respectable performances given what they had to work with. And Cate Blanchett.. wow, just wow. She is a shoo-in for an Oscar Nomination and maybe even a win. I can’t really say it’s career-best seeing as how I haven’t seen that many of her movies and I don’t know what to compare it to, (She was [barely] in ‘The Hobbit’, and apparently she’s going to be in How To Train Your Dragon 2. Awesome) but she was wonderful nontheless. Overall, I can’t say that Blue Jasmine was an awful film, but it wasn’t that good, either. To be honest, it didn’t leave that much of an impact on me aside from Blanchett. If you want to see it, it won’t hurt. (It is pretty short.) But it didn’t do that much for me. I really liked your review- very easy to read and understand. With that, I do not think I would like to see it even though it is the kind of movie that attracts me. Good luck !